We will NEVER give or sell your personal details, including your real email address, to anyone. You will still receive emails to your existing email inbox and can click on links as usual. As the Me and My ID email address you give away is unique for each organisation you interact with you can cut them off one by one. And if a company sells your details, you will know who did it by seeing which Me and My ID address receives the spam. By using Me and My ID you will be more secure online. If you use a Me and My ID email address as your username on other sites, if allowed, then you will always have a different username for each site (using the same username and password for multiple sites puts you at the highest risk of being hacked). We value your privacy. Unless you give us specific permission when you need our help, we can't read your emails or see your replies, nor can we see to which sites you personally sign-up. Use of the Me and My ID service with the email address you register today will remain free for the life of that email address. We are promising this to thank those who support us and spread the word as we get started. Naturally, we may charge new users a modest fee in future, so register today to guarantee your indefinite free access. Tell your friends to join now while they have the chance to do so for free as well. To help us avoid needing to charge anyone else in the future and so that we might add other services to this site, please consider making a small donation towards our running costs using the button below. We want you to be able to have one email address for life, without worrying that it will become so clogged-up with spam that you are driven to abandon it and start over with a new address, in spite of how inconvenient that is for your friends and family. Me and My ID is a simple way to take back control of your email address. Only you and your closest friends need ever know your real email address – for everyone else e.g. marketing firms, give them a different, unique Me and My ID email. That way, you'll know if it was given or sold to other businesses without your permission, as they'll be using the unique address you created for the business you intended to hear from. If you start getting too much junk, you can simply reject emails to the unique address that's receiving it and cut ties completely with the offending supplier and all those they gave your address away to as well. Don't rely on ticking the boxes to decline marketing emails or refusing permission for your details to be shared with “carefully selected partners” – theft of personal data is rife and there are too many unscrupulous traders in personal information to rely on this. 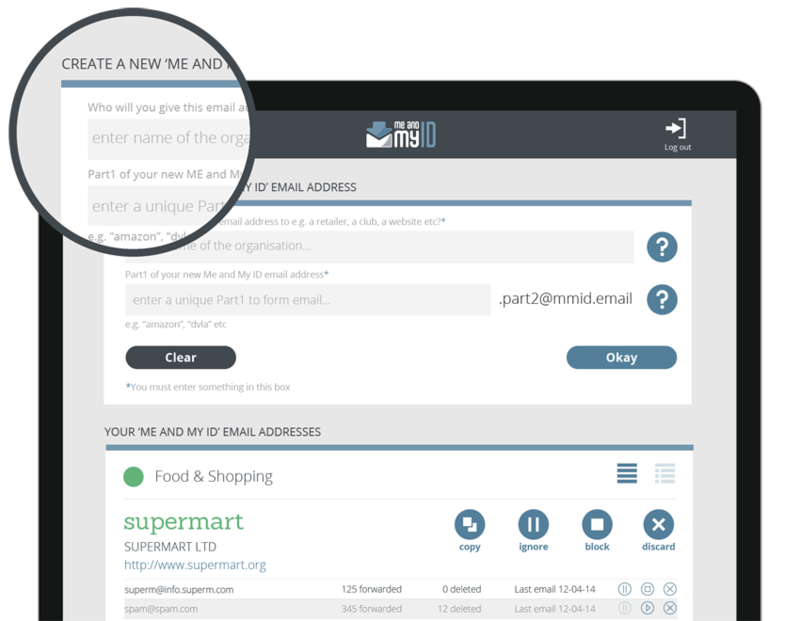 Me and My ID puts you back in charge of who contacts you, without having to manage multiple email accounts.